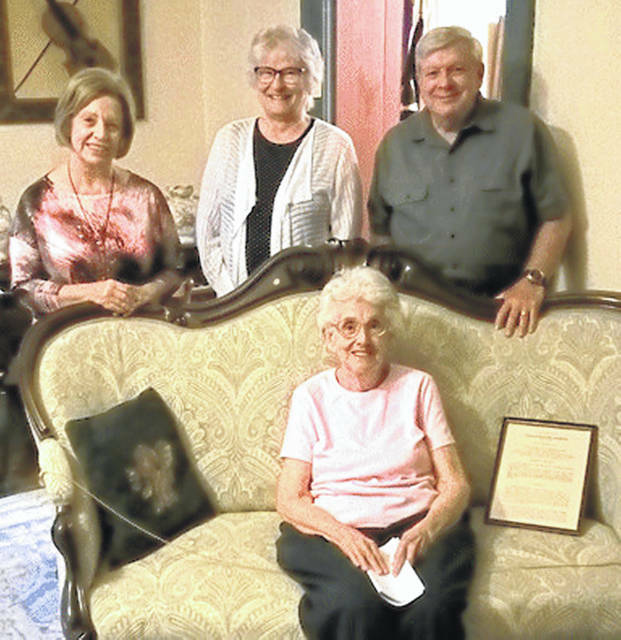 Pictured at the Highland House Museum on East Main Street in Hillsboro are: Jean Wallis (seated) and (standing, l-r) Nancy Wisecup, Carolyn Hastings and Jim Rooney. Do you know the Highland House Museum operated by the Highland County Historical Society has a library? Don’t feel bad. “People don’t know it’s here, and we’d like to change that,” said Carolyn Hastings, secretary of the HCHS Board of Trustees and on the library team, along with Jean Wallis, Nancy Wisecup and Jim Rooney. Located on the second floor of the Highland House, the library’s doors have been mostly shut in the past, but are now open on Thursdays when the museum is open from 1-5 p.m. So what’s inside the library? There are old photos of many different things and many different eras, there are history magazines, books from Highland County authors, books on military history and Ohio history. There are family Bibles and family scrapbooks and there are old yearbooks (the society accepts yearbooks if folks would like to donate) and many other reference items. “Jean (Wallis) donated a significant amount of items to the library, and we’d like to thank her for everything she’s done for the historical society,” Hastings said. As most folks know, the Highland House is located at 151 E. Main St., a block east of the junction of U.S. Route 50 and U.S. Route 62. The new hours for the museum are 1-5 p.m. on Thursdays and Saturdays. The Highland County Historical Society has a self-guided tour which is mobile-device friendly, so bring your SmartPhone or tablet/pad device when you visit the Highland House. Built in 1842-44 by Peter Leake Ayres, the Highland House is a former tavern and stagecoach stop that now houses the society. The museum is a treasure trove of 200 years of items, including period clothing, textiles and quilts, fine furnishings, silver, china, music instruments, documents and books, as well as a collection of primitive farm and kitchen tools. The society’s Hall of Fame celebrates notable persons from Highland County. One wayu to help support the historical society is to become a member. The society depends on several streams of income to operate, but the most vital is its membership base. Membership costs are a little as $15 for a single person and $25 for a family. For more information on the Highland House and the Highland County Historical Society, you can call 937-393-3392 or email hchistoricalsociety@gmail.com. https://www.timesgazette.com/wp-content/uploads/sites/33/2018/09/web1_Historical-museum-pic.jpgPictured at the Highland House Museum on East Main Street in Hillsboro are: Jean Wallis (seated) and (standing, l-r) Nancy Wisecup, Carolyn Hastings and Jim Rooney.